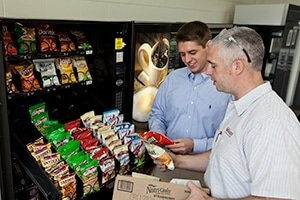 WHOLESALE SNACKS & SNACK Products for vending machines and Micro Markets. Please contact the Snack Wholesale Supply Company direct for more information about the snack products they sell and pricing. Conns Potato Chips Company – Potato Chips for your vending machines! You can order online and we will ship anywhere USA! Great-Tasting Potato Chips and Snack Foods Are Traditional Favorites – History Page History Established in 1935, our family-owned business has satisfied millions of American snackers with our premium potato chips and delectable snack foods. Visit ConnsChips.com. Herr’s Snack products; Potato Chips, Tortilla Chips, Popcorn and More!! For more information on how Herr’s can help increase your vending sales. Hostess Brands, Inc. is one of the largest wholesale bakers and distributors of fresh-baked bread and sweet goods in the U.S. Our 19,000 employees operate 36 bakeries and 570 Bakery Retail Outlets and run approximately 5,500 delivery routes from 565 Distribution Centers nationwide. Our brands include some of the best-known snacks and breads in the United States, including Hostess® Twinkies, CupCakes, Fruit Pies, Ding Dongs, Ho Ho’s, Sno Balls, Donettes, as well as Drake’s® Cakes, Wonder® bread, Home Pride®, and Nature’s Pride®. Visit our website www.hostessbrands.com/careers to view career opportunities with Hostess Brands. Kraft Vending and OCS – Wholesale suppliers of Salty Snacks, Food Snacks and Nuts for the vending business industry. Lance.com – Snacks, Snack Crackers, Nuts, Cheese Snacks, Snack Cakes, Cookies, Wafers and more! Mars Incorporated – Mars snackfood brands are among the world’s best-loved and most widely available confectionery products, with M&M’S, MARS, MILKY WAY, SNICKERS and TWIX among those at the top – and in ice cream versions too. Confectionery tastes great, but it is reassuring to know that Mars snackfoods have real food value that adds interest and variety to a normal balanced diet. Morgan’s Specialty Snacks, LLC is a growing wholesaler and distributor of organic, gluten-free, non-GMO, kosher and vegan snack foods and beverages. We are a family-owned and -operated business working to provide the best quality in delicious, nutritional snacks, and we are committed to making them more readily available than ever. Whether you have food allergies or simply prefer specialized, nutritious snacks that align with your health-conscious lifestyle, you can count on us to serve up the finest. visit www.morgansspecialtysnacks.com. New Century Snacks -For more than thirty-two years we have been the experts in crafting seasoned nuts and unique trail mixes. We provide a large portfolio of snack products with versatile packaging capabilities. WE BELIEVE in investing in the right people, delivering consumer driven innovation and crafting high quality products to drive category growth. Snacks Over America Inc. Order your vending snacks online can be very easy!! We offer all types of products including: Snacks, Chips, Cookies, Trail Mixes, Nuts, Candy products and so much more! Our company is Based out of Memphis, TN – We ship to USA and Worldwide! Stryker Jerky – Healthier Snack For A World On The Go! We sell 100% all beef, grass fed beef sticks. NO MSGS, NO HORMONES, NO NITRATES, NO PORK, NO CHICKEN. Ask about pricing for our products packaged for vending machines and micro markets! Stryker Jerky is dedicated to providing healthy snacks and support to our nation’s military and their families. Visit https://strykerjerky.com. SULTANA DISTRIBUTION SERVICES – As the nation’s only Full-Line Confectionery & Snack Redistributor, Distributors throughout the country rely on Sultana to economically and efficiently manage and maintain their inventory. SDS consolidates and ships hundreds of confectionery & snack items to over 1,500 Wholesale Distributors of all sizes throughout the continental United States.